Thara Patong Beach Resort is centrally located on Patong Beach with a superb combination of location, prices and services. 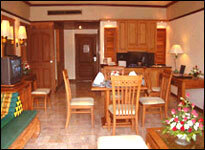 It is just only a short stroll to the beach and the bustling shopping and nightlife areas. It is approx. 40 km. 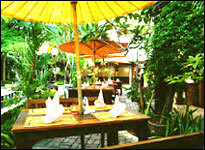 from Phuket International Airport (about 45 minutes drive) and about 20 minutes drive from Phuket Town. The hotel has 2 beautiful free-form shape swimming pools. Each pool has Jacuzzi and children's pool. Each room looks out on the serenity of our tropical gardens or pools from the private balcony (or Terrace). 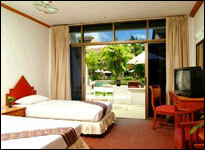 The hotel has 172 rooms, each room looks out on the serenity of the tropical gardens and pools from each private balcony. The Deluxe rooms in Tamarind Wing have both a Queen size bed and one single bed / The bathrooms have a separate bathtubs and showers. 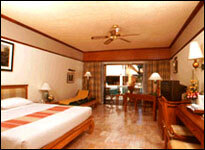 The ground floor rooms of Tamarind Wing have a very popular direct patio access to the swimming pool. The entire top floor is Non-Smoking. 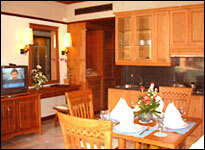 The One and Two Bedroom units all have a separate Living Room that includes a fully equipped mini kitchenette. 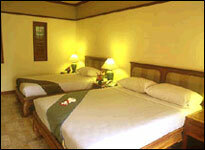 Handicapped adapted rooms are also available. - Complimentary coffee and tea bags with electric hot water pot for your own service are put in every rooms except Standard rooms. Please enjoy the oriental cuisine, exotic traditional Thai Food, Nightly display of the fresh seafood, cooked to your oder with a complimentary salad bar. Open daily 06.30 a.m. till midnight. 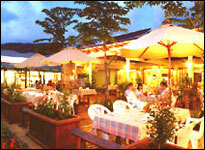 Specializes in Italian cuisine; innovative home made pasta, and unique wood oven pizza selections and more salad bar. Open daily from 10.00 a.m. till midnight. 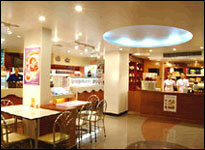 Enjoy the refreshment of variety of the world best ice cream and fresh home-made bakery and fresh brewed coffee. Open daily from 10.00 a.m. till midnight. Located on the ground floor of the building E. We serve a wide selections of Thai and Asia cuisine light meals, snacks and drinks. Open daily from 10.00 a.m. till 19.00 p.m.
2 Pools, jacuzzi and children’s pool: The hotel has 2 beautiful free-form shape swimming pools. Located adjacent to the regular pools are our children’s pool with fountains, slides and Jacuzzi – immensely popular with both children and parents alike. Our Tamarind Pool features a big and safe children pool with waterfall, shower mushroom, fountain, mini-beach and water-spouting whales. 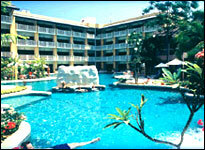 A huge tropical adventure pool with deep and shallow ends plus spa pools for the whole family to enjoy. Pool Side Bar: Full service bar with drinks and snacks beside the pool. 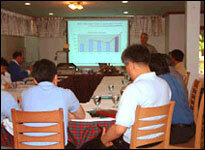 Meeting and function room: is available for meeting up to 50 people, with equipment such as LCD projector, overhead projector, slide projector. Open daily 08.00 a.m. - Midnight. from 06.30 a.m. - 11.00 p.m. Fitness: Free of charge. For In-House guest only. Open daily 09.00 am. - 07.00 pm.